Gisela must hold on to hope and love despite all odds in the midst of a war-torn country. Gisela Cramer is an American living in eastern Germany with her cousin Ella Reinhardt. When the Red Army invades, they must leave their home to escape to safety in Berlin. However, Ella is a nurse and refuses to leave, sending her young daughters with Gisela. During their journey, Gisela meets Mitch Edwards, an escaped British POW. She pretends she is his wife in order to preserve his safety among other Germans, especially one wounded German soldier, Kurt, who has suspicions about Mitch's identity. Kurt also has feelings for Gisela and tries to uncover the truth about her "marriage." In this moving, historically accurate portrayal of WWII Germany, the characters learn that, even with destruction all around them, some things last forever. I really loved the first book by Liz Tolsma, Snow on the Tulips. This book I did enjoy, just not as much. I loved the characters and the setting. Set during World War II this book takes you on an adventure of courage while Gisela and Mitch take young girls to safety. I enjoyed reading about the war torn countries and what was going on with the war to the people in the area. The romance I didn't really enjoy, it didn't really click with me and the story line. . If you enjoy history set in this time period, this book is very well written! If you aren't a big history fan I don't think you will enjoy this book, it's a heavy story with many details. While this is a part of the Women of Courage series, each book can be read apart from the other. 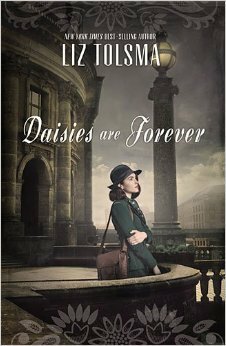 Liz Tolsma's latest WWII historical fiction novel, Daisies are Forever, is getting rave reviews. Liz celebrating the release with a Kindle HDX giveaway! Enter today by clicking one of the icons below. But hurry, the giveaway ends on May 31st. Winner will be announced June 2nd on Liz's website. Don't miss a moment of the fun; enter today and be sure to stop by Liz's website on June 2nd to see if you won. A Bridge Unbroken Book Review and eBook Giveaway! Modern Pioneering Paperback Book Giveaway!